This Shifting Gears report is the first to examine how behavioural insights could drive culture change in the public sector. It applies the increasingly prominent ‘nudge’ concept to the public service itself. Our Shifting Gears research series reviews the trends and challenges facing Canadian governments and provides strategic recommendations for navigating them. The reports focus on supporting an emerging model for public service that can make government more citizen-centred, focused on results, integrated, digitally-enabled, and engaged with partners. Much of the focus of current public sector reform efforts has been on sweeping, transformative changes at a systems level, aimed at improving programs and services while achieving lasting savings. These reforms, while required, are also hugely disruptive, difficult to implement and often involve significant up-front costs. To succeed, they should be supported by an enabling organizational culture, as well as improved processes and structures. Some governments are starting to use applied insights from the behavioural sciences to influence the behaviour of citizens. For example, shifting the default on forms to ‘opt-in’ rather than ‘opt-out’ can lead to much higher participation rates for organ donation or retirement contributions. Similarly, establishing an interpersonal commitment on water conservation through home visits makes people far more likely to take action than they would if they had simply received an impersonal letter. By making positive behaviours easier—or even effortless—governments can shift away from traditional, expensive regulatory and programmatic interventions to low-cost, subtle interventions that have positive impacts in the public interest. To date, these behavioural insights have been deployed by governments to influence the behaviour of the public. This report makes the case that these insights should also be deployed to influence the culture of the public service. 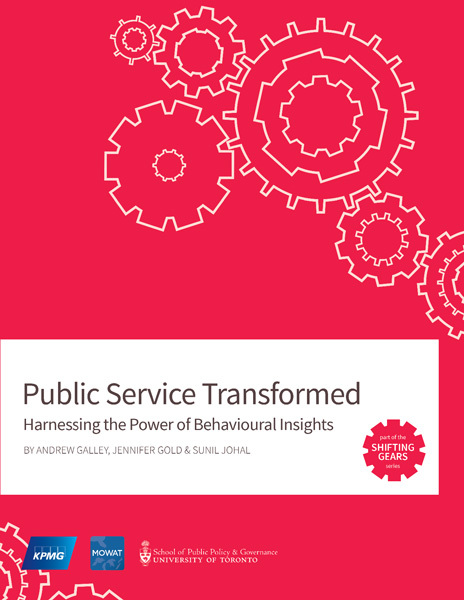 Drawing on focus groups, expert interviews and the research literature, this report assesses opportunities for governments to leverage behavioural insights to drive progress in four areas that are crucial to government transformation: greater transparency, enhanced collaboration, accelerated innovation and robust evaluation. Governments should create specialist teams that examine and test the applicability of behavioural insights to public service reform. To date, governments have been most successful in applying the insights of behavioural science to public policy where dedicated units have been available to support policymakers. 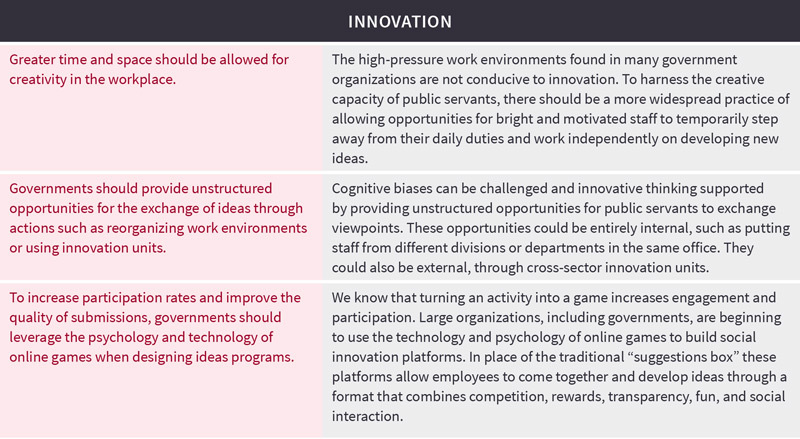 Acting on behavioural insights in public service reform will require similar supporting infrastructure. Public servants, more than anyone else, recognize that there are structures, processes, and behaviours that make it challenging to achieve some of the transformations that they are asked to deliver. 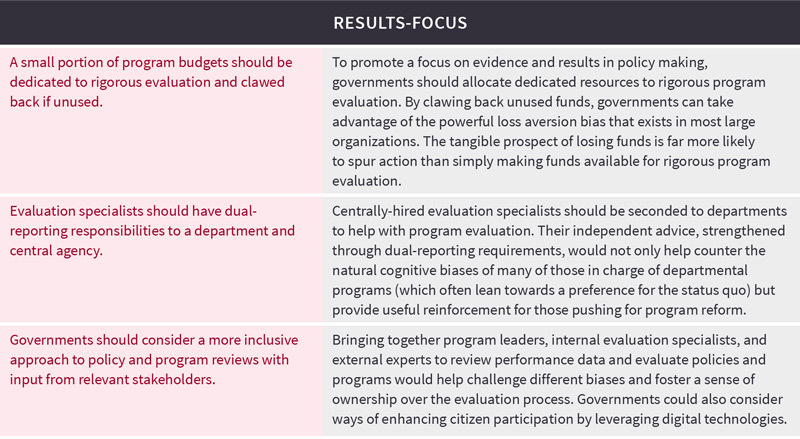 This report makes the case that—even in times of fiscal constraint—there are low-cost ways to incent the culture change necessary for governments to deliver better services with fewer resources.